QuickBurn MP3 - Burn MP3 files to Audio CD' s directly from WinAmp! Let us introduce you ClickSmash Production's QuickBurn MP3, the Audio CD Burning add-on program for WinAmp (If you're not familiar with WinAmp yet, then click here). The QuickBurn MP3 WinAmp-styled window places itself above the WinAmp window each time you start WinAmp wheter QuickBurn from the Start Menu. 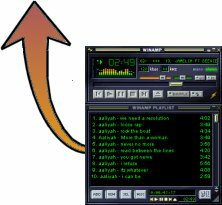 The program allows you to burn the MP3 and/or WAV files listed in your WinAmp playlist with one click to a high quality Audio CD. QuickBurn MP3 supports burning speeds between 1 - 32 x and loads of CD-Burner types! The latest technologies like BURN-Proof are integrated too. Burn your playlist directly onto CD! Buy it now for only US$ 12.00 ! Happy, easy and qualitative burning for provided by ClickSmash Productions..